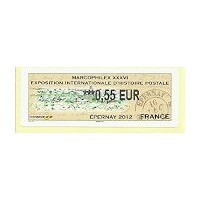 IER - LISA 2 (20.10.2012) - MARCOPHILEX XXXVI - Exposition Internationale Histoire Postale - Epernay 2012. ATM small value (0,01 EUR), pictorial first day postmark. 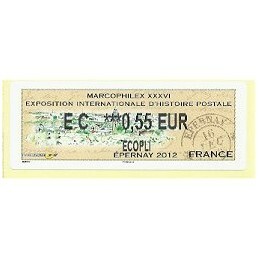 IER - LISA 2 (20.10.2012) - MARCOPHILEX XXXVI - Exposition Internationale Histoire Postale - Epernay 2012. ATM inland value (0,55 EUR), pictorial first day postmark. IER - LISA 2 (20.10.2012) - MARCOPHILEX XXXVI - Exposition Internationale Histoire Postale - Epernay 2012. Mint ATM, NEW INDICATORS (0,01 EUR COMPLEMENT D AFFRANCHISSEMENT ECOPLI). IER - LISA 2 (20.10.2012) - MARCOPHILEX XXXVI - Exposition Internationale Histoire Postale - Epernay 2012. Mint ATM, NEW INDICATORS (0,01 EUR MINI MAX). 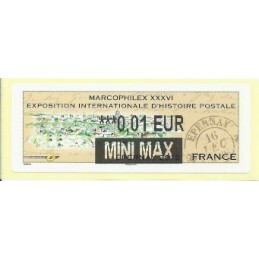 IER - LISA 2 (20.10.2012) - MARCOPHILEX XXXVI - Exposition Internationale Histoire Postale - Epernay 2012. Mint ATM small value (0,01 EUR). IER - LISA 2 (20.10.2012) - MARCOPHILEX XXXVI - Exposition Internationale Histoire Postale - Epernay 2012. Mint ATM domestic value (0,55 EUR). IER - LISA 2 (20.10.2012) - MARCOPHILEX XXXVI - Exposition Internationale Histoire Postale - Epernay 2012. 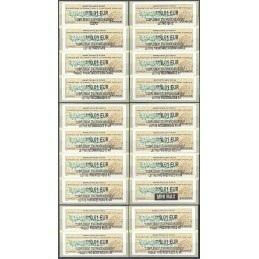 Mint ATM domestic value - new face value imprint (EC 0,55 EUR ECOPLI). IER - LISA 2 (20.10.2012) - MARCOPHILEX XXXVI - Exposition Internationale Histoire Postale - Epernay 2012. 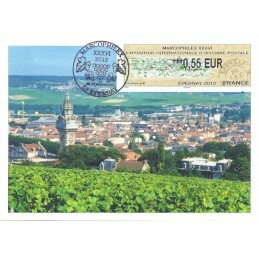 First day cover, with ATM - new face value imprint (EC 0,55 EUR ECOPLI) and pictorial postmark. IER - LISA 2 (20.10.2012) - MARCOPHILEX XXXVI - Exposition Internationale Histoire Postale - Epernay 2012. 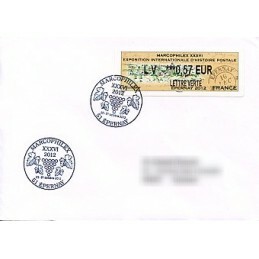 First day cover, domestic mail - new face value imprint (LV 0,57 EUR LETTRE VERTE). IER - LISA 2 (20.10.2012) - MARCOPHILEX XXXVI - Exposition Internationale Histoire Postale - Epernay 2012. 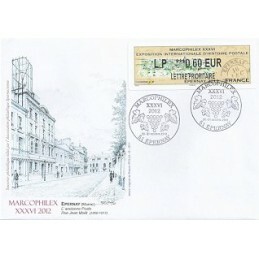 PICTORIAL First day cover, with ATM - new face value imprint (LP 0,60 EUR LETTRE PRIORITAIRE) and pictorial postmark. IER - LISA 2 (20.10.2012) - MARCOPHILEX XXXVI - Exposition Internationale Histoire Postale - Epernay 2012. 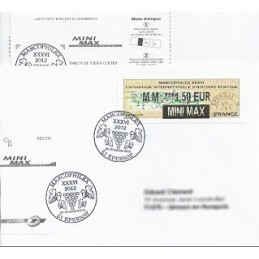 First day cover, with ATM - new face value imprint (MM 1,50 EUR MINI MAX) and pictorial postmark. With receipt. 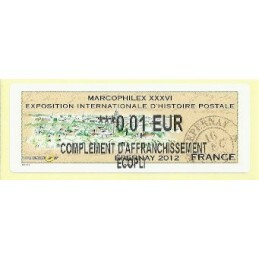 IER - LISA 2 (20.10.2012) - MARCOPHILEX XXXVI - Exposition Internationale Histoire Postale - Epernay 2012. 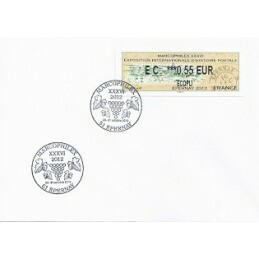 First day cover mailed to Poste Restante, with ATM - new face value imprint (LP 0,60 EUR LETTRE PRIORITAIRE), with arrival postal marks. Pictorial postmark and postal indexation. IER - LISA 2 (20.10.2012) - MARCOPHILEX XXXVI - Exposition Internationale Histoire Postale - Epernay 2012. 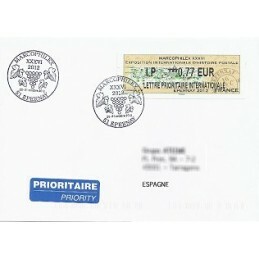 First day cover mailed to Spain - new face value imprint (IP 0,77 EUR LETTRE PRIORITAIRE INTERNATIONALE), with pictorial postmark. With postal indexation. IER - LISA 2 (20.10.2012) - MARCOPHILEX XXXVI - Exposition Internationale Histoire Postale - Epernay 2012. 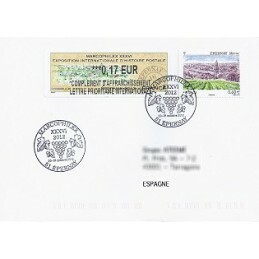 First day cover mailed to Spain, with Epernay stamp and franking complement with ATM (0,17 EUR COMPLEMENT D AFFRANCHISSEMENT LETTRE PRIORITAIRE INTERNATIONALE), with pictorial postmark and postal indexation. FRANCE (2012). 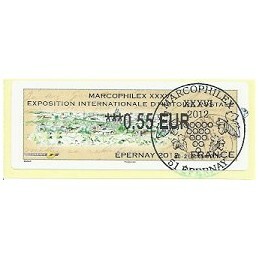 Marcophilex XXXVI Epernay. Set 4 val. IER - LISA 2 (20.10.2012) - MARCOPHILEX XXXVI - Exposition Internationale Histoire Postale - Epernay 2012. 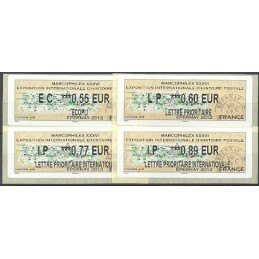 Mint set 4 values - new face value imprint (EC 0,55 ECOPLI - LP 0,60 LETTRE PRIORITAIRE - IP 0,77 LETTRE PRIORITAIRE INTERNATIONALE - IP 0,89 LETTRE PRIORITAIRE INTERNATIONALE). FRANCE (2012). Marcophilex XXXVI Epernay. Set 6 val. IER - LISA 2 (20.10.2012) - MARCOPHILEX XXXVI - Exposition Internationale Histoire Postale - Epernay 2012. 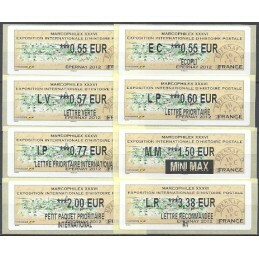 Mint set 6 values - new face value imprint (0,55 - EC 0,55 ECOPLI - LV 0,57 LETTRE VERTE - LP 0,60 LETTRE PRIORITAIRE - IP 0,77 LETTRE PRIORITAIRE INTERNATIONALE - MM 1,50 MINI MAX). FRANCE (2012). Marcophilex XXXVI Epernay. Set 8 val. IER - LISA 2 (20.10.2012) - MARCOPHILEX XXXVI - Exposition Internationale Histoire Postale - Epernay 2012. 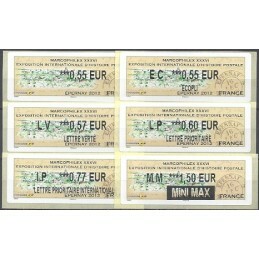 Mint set 20 values with all the NEW INDICATORS, small values (COMPLEMENT D AFFRANCHISSEMENT). 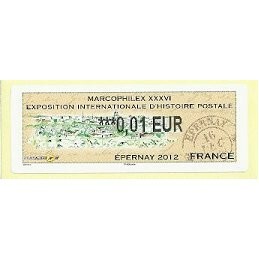 IER - LISA 2 (20.10.2012) - MARCOPHILEX XXXVI - Exposition Internationale Histoire Postale - Epernay 2012. Maximum card with ATM (0,55 EUR) and pictorial first day postmark.